There’s a certain magic to riding Washington’s ferries, whether you’re a bleary-eyed commuter or a wide-eyed visitor. For years, both these parties might agree, that magic ended the moment you set foot in the galley. The unapologetically beige restaurant areas on the nation’s largest ferry fleet mostly trafficked in bags of chips and soft pretzels and meals in plastic wrappers. Savvy riders bought coffee before boarding. Others seemed to forget the food and drinks were there at all. Now, hop a ferry to Bainbridge Island and Caffe Vita coffee cups are ubiquitous as skyline selfie takers. Last year Washington State Ferries signed its first new concessions contract in 11 years, with Centerplate, the national company that also handles food at Safeco Field. 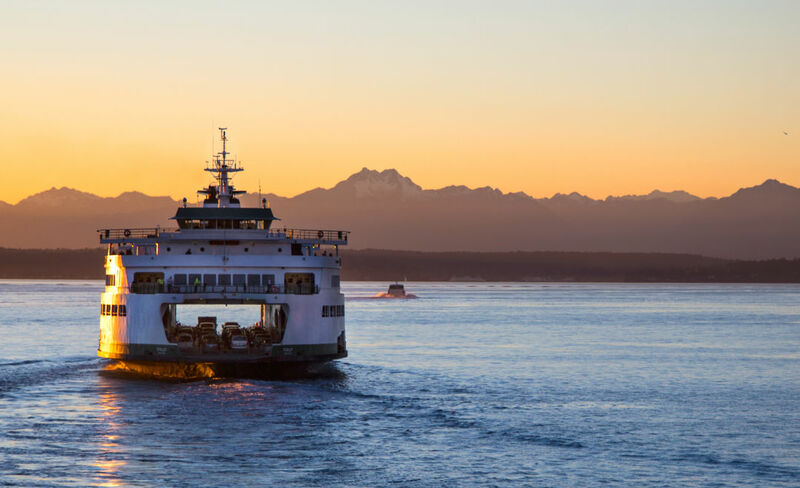 Its Bremerton-based predecessor, Olympic Cascade Services, fought to keep the contract; Centerplate won out on its proposal to make ferry food more local. The first order of business was better coffee, says Centerplate general manager Joshua Pell. Along with Vita came other familiar names, like Beecher’s mac and cheese, Uli’s sausages, Sound Kombucha, and Seahawks cookies from Schwartz Bros. The chips and soft pretzels remain, alongside enough hip and mindful snacks to fuel a yoga retreat, like chocolate-dipped almonds from Ballard-based Wild Things and (oh glorious day) Ellenos Yogurt. Serving food aboard a floating extension of the state highway system is a daunting balance of equipment restrictions and Coast Guard safety regulations: Centerplate’s garlic fries are a hit at Safeco, but deep fryers are barred on board. Instead the ferries serve tots loaded with Uli’s bacon and Beecher’s cheese. They’re a hit, even after their sojourn beneath heat lamps. Passengers headed home, or venturing to waterside destination restaurants don’t want full-on entrees, says Pell. 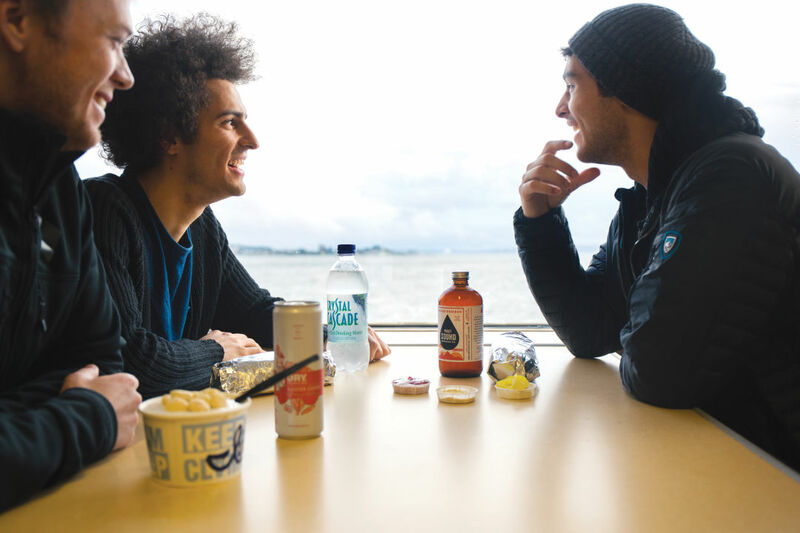 They do want drinks: Boats now carry three local drafts and more local canned beer—IPAs and pale ales from outfits like Sound Brewery or Silver City—and Washington wines. That’s the thing about ferries; you don’t have to travel far to feel transported.